Victim or Villain: How to avoid turning a Condemnation into an Apology? It seems now that we have reached the point in the media and in society at large that whenever there is a terrorist attack performed by Islamic extremists the conversation comes in two rounds. One: condemnation and then -as if to counter any calls of racism – the next round of ‘Muslim as Victims’. While on the one hand I do see some positive aspects to this: it reminds that ‘Muslim’ is not one all-same category, it reminds that extremists will kill even those who adhere to the same religion they claim to stand for; and on a practical level it hopes to probably limit backlashes at Muslim communities; I also question what it is that this sort of rhetoric and representation does in reality. Villain, victim or none of the above?? I can’t get my head around it. In a wider way, this thinking of Muslims as “other” but in two main categories, victim or terrorist, demeans all lived experiences of being a Muslim. All Muslim women are immediately victims by virtue of the patriarchy existing; and then all Muslim men are either terrorists, and the ones who aren’t are victims to them. It’s simple. (And we silence any non-gender-specific categories). This sort of imperialist, othering, logic also serves to allow the ‘white savior complex’ to flourish big time. It allows the west to engage in huge wars overseas both to save the victims of Islam, and to kill Islamic terrorists. There are no middling people. For me, this whole discourse makes it very difficult to condemn terror attacks. For if I condemn something like the Hebdo killings, I feel that by virtue simply of who I am, the condemnation becomes a plea and an apology. 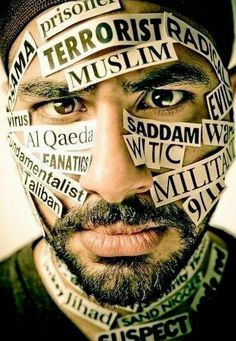 It frames me as a victim also, a victim to these terrorists who have slighted my religion, a victim to growing Islamophobia and a victim to the media. But I refuse to be a victim in this way, for to do so frames my condemnation as an immediate apology. But what do I have to apologise for? I have done nothing wrong… On the other hand I do condemn these murders, but how do I voice that, or frame that without the underlying message of, “see, I’m a Muslim and I oppose what they did, hence, not all Muslims are terrorists.” It seems almost impossible to convey anger or sadness without also indicating some sort of implicit shame, or desire to defend. I have nothing to defend myself against. I am not a villain. But I also refuse to be a victim. In any way. And so it is that I become trapped and unsure as to how to react in situations like this. For, not to condemn is suspicious, while condemning is taken as an apology for my personhood. And I am not sorry for existing. Next Next post: Freedom of speech or ‘Us’ against ‘Them’?